Rosy Outlook: "Twist" on Basics + FF Link-Up! "Twist" on Basics + FF Link-Up! Happy Wednesday loves! Sorry that I missed my post on Monday. I always HATE missing posts but sometimes I just get major writers block over the weekend and it was definitely one of those weekends! I think my mind is just all over the place with the move coming up. This weekend was super fun though--on Saturday I got brunch with two of my besties then we spent the rest of the day relaxing. Sunday the weather was actually SO nice which we were beyond excited about after a full week of rain and thunderstorms. We went for a nice long run with the pup and it was just gorgeous. All the flowers are in bloom and I am LOVING it! I love when you can take a basic tee or just a plain shirt and make it look totally different by adding a cute little knot, twist or tie. This plain OTS top is adorable but it just doesn't sit quite right at the waist. That's why I decided to add this fun little knot! Just adds a little something extra. Well, that is the cutest lil knot front twist I ever did see! LOVE this outfit! This is the best outfit! I love that too and how casual but still cute this outfit is! So cute! I love those jeans and those mules are SO good! We officially move into our apartment on July 8th! And I am taking that whole week off to get everything settled and explore:) Can we get together for coffee or something?! I have been loving the knotted shirt details for Spring and Summer. It's so fun! You styled your top perfectly with the denim. I love knotting a tee to change up its look, and I love how this looks on an OTS style tee! I love those mules too--they look like they go with everything! I love this look! Super cute. I love how yo combined basic pieces but each with their own little spectacular details! Love this cool and simple look! Those jeans are amazing on you and I love how you knotted your tee! I love how a simple knot can completely change the look and feel of a piece! 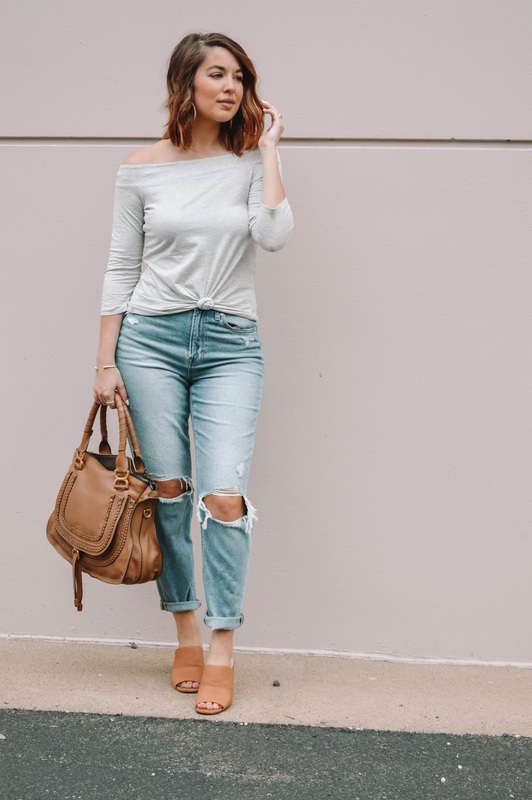 This is a perfect easy weekend outfit. This is such a cute knotted top. I love the shade of gray and the off the shoulder look! This top is so pretty and really adds a little extra something to this look. Loving your hair too! 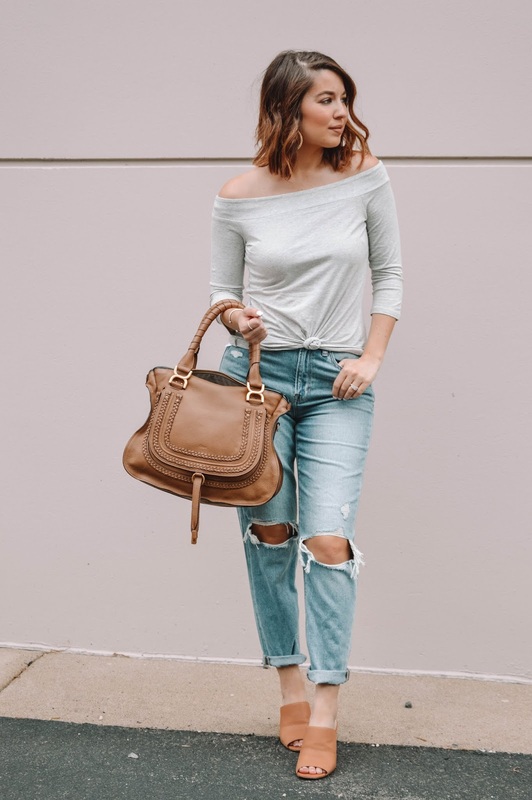 Love how you make basic sweater and distressed jeans look so chic dear! Also, cute matching shoes and bag too. This is such a pretty casual look! Aww love it! Perfect way to make a tee that's a bit big (but you otherwise love) totally wearable! Love your casual chic outfit, the knot in your tee looks fab! Gorgeous bag!